With 70 facets this strikingly unusual shape takes true craftsmanship to create. For the unexperienced eye, the radiant cut can sometimes be mistaken for the princess cut due to its similarities in shape. However, the radiant cut is considered to be the more practical choice if you enjoy an active lifestyle. A radiant cut diamond is considered a modified brilliant diamond, which takes on the elegance of the emerald shape diamond and the brilliance of the round brilliant cut diamond. It is closely related to the princess cut diamond. It was the first square-cut diamond to have a brilliant-cut facet pattern applied to both the crown and pavilion of the diamond, resulting in a vibrant and lively diamond. The radiant cut was created in 1977 by Henry Grossbard, of the Radiant Cut Diamond Company (RCDC) and first became popular in the 1980s. It can be either a square or rectangular-shaped diamond. It has 70 facets and a length to width ratio of 1 to 1.2-1.5. The square-like shape of this diamond requires it to be cut with greater weight in the pavilion, in order to maximise the light that can enter and be refracted back to the eye. The facets of the radiant cut create the image of cracked ice within the diamond – a unique characteristic that sets it apart from other diamond cuts. There are variations in the shape of a radiant cut diamond, with some buyers preferring a more square shape, and others a more rectangular shape. A rectangular radiant cut diamond is a good choice for someone who appreciated the beauty of the emerald cut, but wants more brilliance and scintillation. Because of its brilliance, the radiant cut diamond is more forgiving when it comes to clarity, than other square cut diamonds like the emerald or square emerald diamond cuts. Extra facets often help conceal inclusions. Its brilliance also gives a well-cut radiant diamond the appearance of having a better colour than a stone with a simpler cut. The radiant cut maximises the diamond’s carat weight by using more of its weight in visible ways. Unlike many other cuts, it does not carry a lot of extra weight beneath the surface of the stone (if it did, the diamond would retail at a higher price, as a larger depth will result in a larger carat weight). 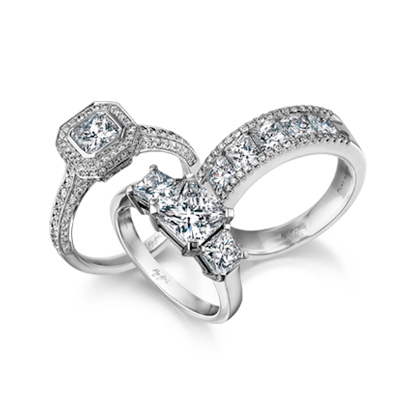 Radiant cut diamonds require prongs that hold the diamond securely, and protect the corners from chipping. When set within the prongs, the radiant cut diamond looks very similar to a princess cut diamond, and to the inexperienced eye, their similarities sometimes make them indistinguishable. A radiant cut diamond is considered a more practical choice for an active lifestyle, as its corners are less delicate and more durable than those of a princess cut. Because a radiant cut diamond is known for its brilliance and kaleidoscope of colours, it requires the skilful eye and detailed precision of an experienced master craftsman. It requires absolute precision to achieve the reflection and refraction within the diamond, and to achieve its brilliant appearance and strikingly unusual shape. A radiant cut diamond is associated with energetic, spirited, social and exuberant personalities.